Turkish President Recep Tayyip Erdogan has described the Dutch government as "Nazi remnants and fascists", amid a diplomatic row over a cancelled rally. Turkey's family minister was blocked from entering the Turkish consulate in Rotterdam as the spat between the two nations worsened on Saturday. Dutch Prime Minister Mark Rutte said Mr Erdogan's remark was "way out of line". Earlier, a rally in the city due to be hosted by the Turkish foreign minister was banned for security reasons. Turkey has summoned the Dutch charge d'affaires to the foreign ministry in Ankara for an explanation. Foreign Minister Mevlut Cavusoglu had been hoping to harness the votes of the Turkish diaspora in the Netherlands, home to some 400,000 Turks, ahead of a referendum in Turkey next month on whether to expand Mr Erdogan's powers. Austria, Germany and Switzerland have banned similar gatherings where Turkish officials were due to speak. On Saturday, Turkey's family minister, Fatma Betul Sayan Kaya, was stopped by police as she tried to enter the Turkish consulate in Rotterdam after arriving from Germany, where she had held separate meetings. Dutch news broadcaster NOS ran footage of the minister arriving at the consulate and being denied entry by security forces. "We were stopped at the Consulate General of Rotterdam, 30 metres away, and are not allowed to enter," Fatma Betul Sayan Kaya wrote on Twitter. She travelled by land to the Dutch city after hearing that the plane carrying Mr Cavusoglu had been refused permission to land. 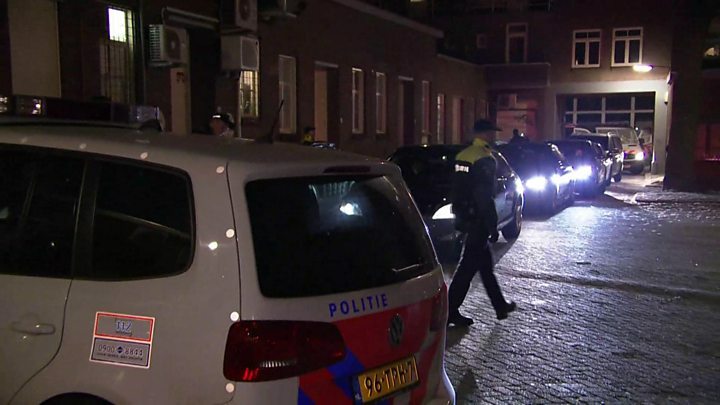 Dutch police earlier closed the road leading to the Turkish consulate in Rotterdam for security reasons. On Saturday evening, hundreds of people waving Turkish flags gathered outside the consulate building in protest. Dozens of supporters of Mr Erdogan stood near the entrance as police erected barriers to prevent demonstrators from getting too close. As the crowd numbers increased throughout the evening, security was stepped up and people were later dispersed. President Erdogan reacted to the ban on his foreign minister by threatening to block Dutch flights. He said: "Ban our foreign minister from flying however much you like, but from now on, let's see how your flights will land in Turkey." Mr Cavusoglu also warned Turkey would impose heavy sanctions if his visit were blocked. Mr Rutte warned in a statement (in Dutch) that the Turkish threat of sanctions made "the search for a reasonable solution impossible". Mr Rutte also stressed that Dutch officials had earlier discussed whether the planned rally with Mr Cavusoglu could be private and "smaller-scale" and held in a Turkish consulate or embassy. The Netherlands "regrets the course of events, and remains committed to dialogue with Turkey," the statement added. Recep Tayyip Erdogan is a canny political operator. While his falling-out with key European allies and explosive comparisons to the Nazis may seem chaotic, it's quite possibly all planned by a man who knows he thrives as the underdog. Sending Turkish ministers to Europe when relations with Turkey are flagging and some European states are nearing elections was never going to be warmly welcomed by the German or Dutch governments. They rose to the bait - and it has allowed Mr Erdogan to paint this as a conspiracy against Turkey and himself as the nationalist Turkish hero fending off the European oppressor. That will rally his support base and the far-right nationalists he's trying to woo before the presidential referendum next month. But it will horrify the other side of Turkey - the pro-European liberals who see their country drifting ever further from the west and their President engaging in unprecedented slander against other Nato allies. What does it mean for the Dutch election? The diplomatic row comes just days before Dutch voters go to the polls. The election campaign has been dominated by issues of identity, the BBC's Anna Holligan in The Hague says. The anti-Islam leader of the Freedom Party, Geert Wilders - who campaigned against the Turkish minister's visit - is expected to make significant gains, our correspondent adds. Are Dutch voters really turning to Wilders? Last week, Mr Erdogan accused Berlin of "Nazi practices" after a number of his rallies were cancelled, drawing a sharp response from the German government. He is seeking to extend his powers in the 16 April vote and targeting millions of expatriate voters - including 1.4 million in Germany. There is uncertainty about whether an event Mr Cavusoglu was due to attend in Zurich, Switzerland, on Sunday would go ahead after one venue refused to hold it. Another event in Zurich scheduled for Friday was cancelled, as were rallies in the Austrian towns of Hoerbranz, Linz and Herzogenburg. The Dutch and Austrian governments have criticised the Turkish government's drive to take its referendum campaign to Turks based in EU countries. Relations between Turkey and European countries have deteriorated since last July's attempted coup in Turkey. Germany has been critical of the mass arrests and purges that followed - with nearly 100,000 civil servants removed from their posts. Many European nations have expressed deep disquiet about Turkey's response to the coup attempt and its perceived slide towards authoritarianism under President Erdogan. Turkey is a key partner in an arrangement attempting to limit the movement of migrants into the EU, but has threatened to "open the gates" if the EU reneges on commitments to provide aid, visa-free travel for its nationals and accelerated membership talks.